So today in the mail we recieve these lovely publications from my college friends Janette and Nathan. And all I can say is just you wait until Nathan has his midlife crisis. You think it's funny now, but he too will someday wish to be young again. And you know what, Nathan has never had that shiny new sports car, now has he. A few hundred for a cell phone bill is nothing compaired to a car. But now that I think of it Tim has had that shiny expensive new vechicle, and a cell phone addiction. -sigh- OK, I loose. 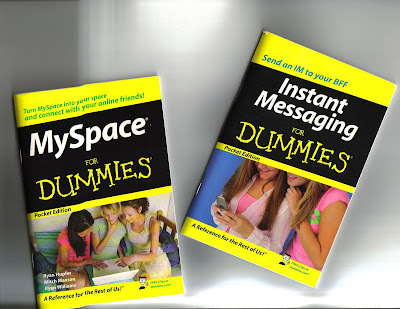 If you look in the back of one of these things they have a short listing of other DUMMIES books you can purchase. I was curious if they had any sort of home improvement book. I did not see one of those but they did have a "Exercise Balls For Dummies" listed. Now for some reason I find that hestiricaly funny. I think it's because the ball is plural. Silly Becky. When I have a midlife crisis I'm not going to want something cool like a sports car. I'll want something geeky like a fast computer or a fancy digital camera. is there an ob? Oh, bother.